El Chalten has a full range of dreamed places for fisherman, inmense lakes, rivers and pools provide a truly optimal environment for the practice of this activity.Seasonal weather changes during spring and summer cause increased river flow and with it the conditions to spawn upstream for the different species.The combination of beautiful mountain scenery, easy access to fishing spots, tourist infrastructure prepared for the visitor, and the abundance of fish give excellent levels of satisfaction to visitor wishing to perform this activity. Daily catch limit is one piece per angler (trout) and two pieces of Chinook. Rio Diablo. Mountain river ending in northern área of Lago del Desierto, access only with a guide. Rio de las Vueltas. The birth of this river is at Lago del Desierto, runs winding 70 km. along the valley before emptying into the Lake Viedma. From the start to the confluence with the Rio Toro catch & release is mandatory, from Rio Toro to Lake Viedma, the daily limit is one piece per fisherman. Laguna Condor. It is located 20 km. 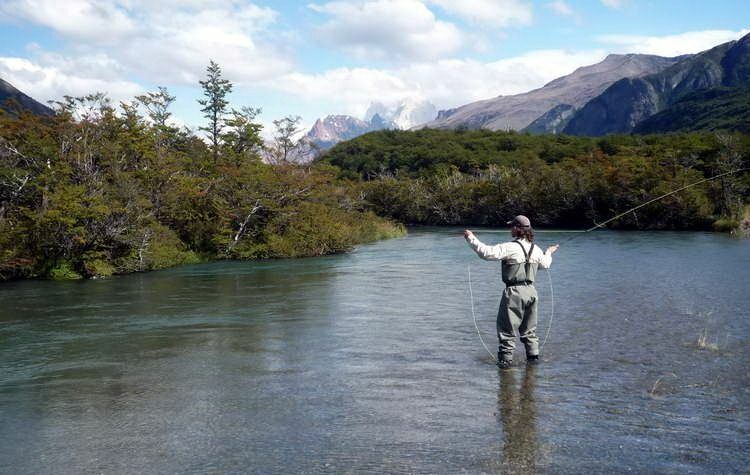 North from the town of El Chalten, formed by a widening of the Rio de las Vueltas, the daily limit is two fish per angler. Lago Viedma. In this glacial lake we can find rainbow trout, brown trout, lake trout, smallmouth perca. Recommendations: Sport Fishing only with official license, respecting rules and arts. Remember to bring back your garbage. Follow the trails. Pets are Forbidden in the área . It is NOT ALLOWED TO LIT FIRE.